Sounds of Aleph and Aum. Two new reviews of Thick and Dazzling Darkness. One comes from Nick Ripatrazone, published at The Millions. Writes Ripatrazone, "In Thick and Dazzling Darkness, O’Leary offers readers a reminder of the complexity of earnest religious poetry. He also offers critics a guidebook on how to examine religious verse: with the respect they should afford earnest subjects. If a poet chooses to believe, let’s hear her song." Another comes from Kylan Rice, appearing in Literature and Belief. Here is a PDF of the review. Writes Rice: "Despite its unusual engagement with [the] terms of [its] debate, O'Leary's book is a methodologically diverse, playful, and attentive reading of ten contemporary poets. O'Leary's prose, which reflects the 'occult convolutions' he sees rippling through the history of American poetry, is alone worth the sale price." That sale price got you down? If you order the book from the Columbia University Press website, and you plug in the coupon code CUP30, you can buy the book at a 30% discount. You should really do it. In other news, I will be at Calvin College in Grand Rapids from June 12-15, at a symposium on Christian poetics. What's going on with the title of this post? One of the all-time greatest poems. I lived in Saint Louis for eighteen months beginning in August 2000. 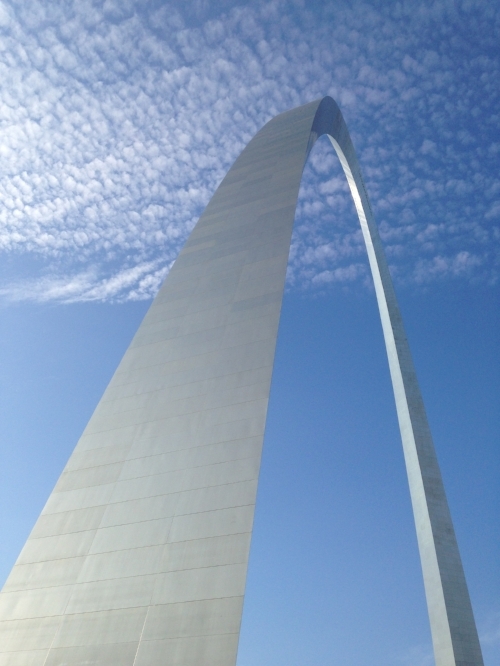 Eero Saarinen's magnificent Thomas Jefferson Gateway Arch is a glorious minimal aleph in maximal size. The photo above was taken on August 21, 2017, the day of the total solar eclipse.